Defining a Baseball Little League infield is easy enough … it’s a miniature of the MLB infield. The players require the same skills, basic physical abilities on which to build, as their professional counter-parts. For the new coach, or a parent trying to decide the best position for their player to begin, I emphasize begin, here are a few brief ways to analyze each position and their Key responsibilities in relationship to the player’s natural talents. (1.) 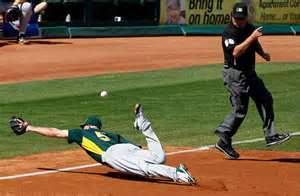 A first baseman must have above average abilities to catch any type of throw. This requires a “good glove”, soft hands, quick feet and possibly above all … no fear of the ball. He’s the error fixer for the entire infield and must be able to attack an errant throw, not shy away from it. (2.) He must be able to cover a large territory, half way to second base on his right, to the fence or stands in foul territory on left and rear, halfway to home plate in front of him. (3.) He must have quick feet being able to quickly shuffle his feet to touch the base with his right foot on a wide throw to his left, or touch the base with his left foot on a wide right throw. (4.) He must be able to leap vertically while maintaining control of his body, glove, feet and eyes. (5.) He must be able to hold a runner close to the base, then quickly move to his fielding position. Theses throws will lead the infielder, shortstop mainly, allowing him a smooth transition for a return throw. Always make the throw chest high. (2.) Touch base with the ball of the foot against the edge of the base, never on the top. (3.) When tossing a ball to the pitcher covering first base, lead the pitcher by tossing the ball where the player will be, not where you’re looking at him as you toss and always make a chest high toss as it’s the easiest height to adjust to an awkward throw and still make the catch. (1.) The second baseman must be able to cover a very large amount of territory from behind second base on his right, to behind and to the fence in foul territory to his left, and into the shallow outfield, especially in right field. (2.) He must be an excellent fielder with quick hands in order to retrieve the ball from the glove and throw on a double play. (3.) He must have a good and accurate arm. (4.) Must be able to field and throw from nearly any position possible. (5.) He must be a good actor. Whether it’s a throw coming in from the outfielder for a runner trying to stretch a single into a double, or quickly moving one way or the other in order to play the hitter the way he’s being pitched to, the second baseman must be able to disguise his actions until the last possible second. (6.) He must be quick to cover first base on a bunt attempt, especially a sacrifice bunt. c. If you field the ball within 15’ of second base, always use an underhand toss, not side arm or over hand. b. A throw to the Right side of the base, move to the rear of the base touching it with your left foot, step back and throw. c. Throw to the Left side of the base, touch base with right foot pushing off the base and throw, or slide the right foot over the base as you field the ball, turn and throw to first. (1.) Probably the Best all around infielder with the glove. (2.) MUST have a very strong throwing arm. The shortstop is responsible for fielding ground balls deep in the hole nearly behind third base, which is the longest throw of any infielder. (3.) Must cover a huge amount of territory, from behind second base to his left, to behind third base all the way to the fence in foul territory, and into shallow left and center field. (4.) Must be smart as he’s responsible for relaying signals to the outfielders. (5.) Must have good communication with second baseman, indicating coverage on stolen base attempts, which normally the shortstop covers for a left handed hitter, second for a right handed hitter, but hitter tendencies or the way he’s pitched to may alter coverage. (1.) Do not take a straight line to a ground ball hit to your right, but rather circle the ball, which has your momentum traveling towards first base when throwing. (2.) When fielding the ball to start a double play, throw from where you field the ball; you may have to sidearm or underhand toss the ball, but you don’t have time for any foot movement into a better throwing position or a crow hop. b. See the backs of the outfielders, the SS becomes the relay man and must run into the outfield. (1.) Third base is known as the “Hot Spot” or “Hot Corner” because of its close proximity to home plate the hit baseball gets there very quickly. 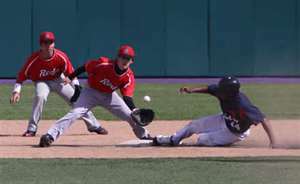 Therefore, it is imperative the third baseman has quick reflexes which enable him to move lightening fast to either side for a few feet, as well as a quick glove. (2.) He must have a strong and accurate throwing arm. Although the shortstop is responsible for the longest throw on the infield, the deep in the hole throw, the third baseman has the most consistently long throws. (3.) He must be quick to his left and try to field every ball hit there. If he can field a ball hit to his left his momentum is carrying him towards first base, the shortstop is moving away. (1.) On a hard hit ball to your side, move at a 45 degree angle backwards in order to field the ball to the side. You create a better angle for reaching the ball. (2.) 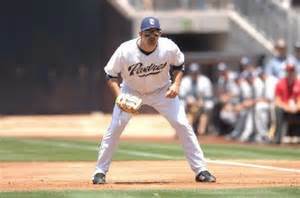 When fielding a ground ball, try to have your left foot slightly in front of your right in order to be able to quickly field and throw the ball. (3.) Always field a bunted ball with your bare hand. You won’t have time to glove it, transfer to the throwing hand and throw. (4.) Runner on first base and a ball hit to your left, instinctively be thinking going to second for the double play. (5.) 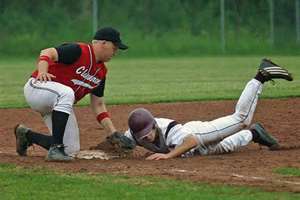 When receiving a throw from the catcher on a steal attempt, straddle the base, facing the catcher, a few inches behind the bag towards left field and apply a swipe tag. You don’t want your left ankle between the base and the oncoming runner. Obviously these are basic elements of what’s required of an infielder, but you must begin somewhere and these tips just might help get you started.